Small Beginnings - Steyer’s Hudson Valley Auto, Inc.
Before STEYER’S became a four generation operation, Nick had a few gas stations in the area. 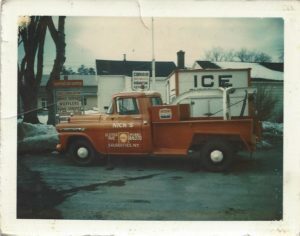 This Polaroid was taken sometime in 1966/1967 when he owned a Shell station on Ulster Avenue in Saugerties, NY. The winch on this 1959 Chevy was customized out of a boom previously used by the US ARMY to move/transport bombs. Note the “CORVAIR SPECIALIST” on the sign in the background: Nick (original owner/operator) went to school and specialized in Corvair repair as a young adult. Corvair was a Chevrolet (General Motors) product with models released between 1960-1969.